Dr. Rebecca DeWitt is originally from Michigan and earned both her Bachelor’s degree and her Doctoral degree from Central Michigan University. She completed her residency at the Durham VA Medical Center in Durham, NC. During her residency she gained valuable experience assessing hearing and balance disorders as well as providing rehabilitation services for hearing loss. 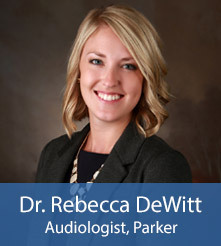 Dr. DeWitt has a passion for helping people hear better and educating them about their hearing loss. In her spare time she enjoys cooking, traveling, hiking, and exploring colorful Colorado. Lori is originally from Kansas, and has lived in Wyoming as well as Southern California. Prior to moving to Colorado in 2015, she and her husband raised their four children on Florida’s Space Coast. She spent many years in customer service with a focus on serving people in the medical and legal fields. For the last seven years, Lori has most passionately worked with people with communication disorders. She considers it a wonderful privilege to help individuals hear better! Some of Lori’s other interests include Bible study, reading, interior design, dancing, training her Yellow Lab – Boudreaux, and exploring beautiful Colorado.